Discover a side of Madrid often missed by travelers. Enjoy the city’s hidden gems, explore less-known neighborhoods and immerse yourself in the sparkling lifestyle of Madrilenos. Escape the crowds and the typical tourist itinerary, follow your private guide and see the city through the eyes of a local. Walk around the hip areas of Chueca and Malasaña and fall in love with the true local atmosphere. Meet your local host in the Chueca neighborhood and make your own way through its streets. Be amazed by cool vintage stores, charming buildings, unique restaurants and much more! Stop by places such as Plaza de Chueca and Plaza del Rey and listen to local stories shared by your host. Make sure you snap some photos while taking in the views over the city from a cool bar known only by locals. It’s time to enjoy the buzzing atmosphere of Mercado San Anton, a local market popular where the Madrilenos go shopping. Get a glimpse of the real lifestyle and take a look at the food stalls. It’s a fun way of spending time like a local. Take a break and rest your feet like a true “Madrileño” with a refreshing drink and tapa at one of the most authentic bars in Madrid. The locals love to go here with their friends and it’s one of the best spots to experience the Spanish culture. Enjoy the charm of Plaza de la Luna, pass by art galleries and artisan shops while getting recommendations from your private guide. 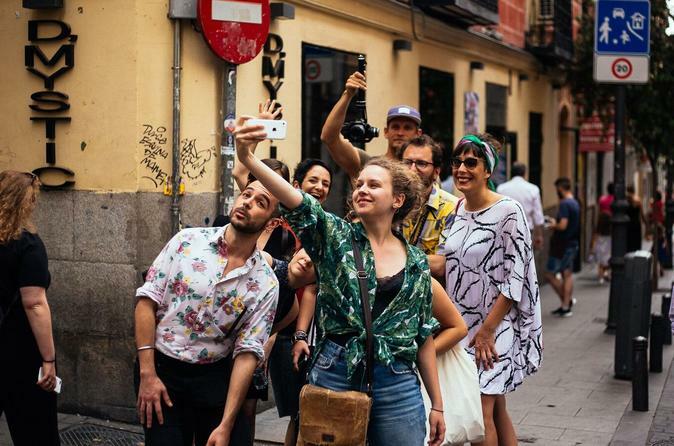 Follow your host and walk along Calle de la Palma and Calle Velarde, two important streets during the Madrilenian Scene, a countercultural movement. End your tour in the heart of Malasaña, a hipster area filled with nice terraces that locals love. All our local hosts know all about the cool spots in Madrid. Let them show you their favorite corners of the city!